President Donald Trump is strongly defending the US use of tear gas at the Mexican border to repel a crowd of migrants that included angry rock-throwers but also barefoot, crying children. “They were being rushed by some very tough people and they used tear gas,” Trump said on Monday of the previous day’s encounter. He said it was “a very minor form of the tear gas itself” that he assured was “very safe.” Without offering evidence, he also claimed that some of the women are not really parents but are instead “grabbers” who steal children so they have a better chance of being granted asylum in the US. Trump portrays them as a threat to U.S. national security, intent on exploiting America’s asylum law, but others insist he is exaggerating to stoke fears and achieve his political goals. 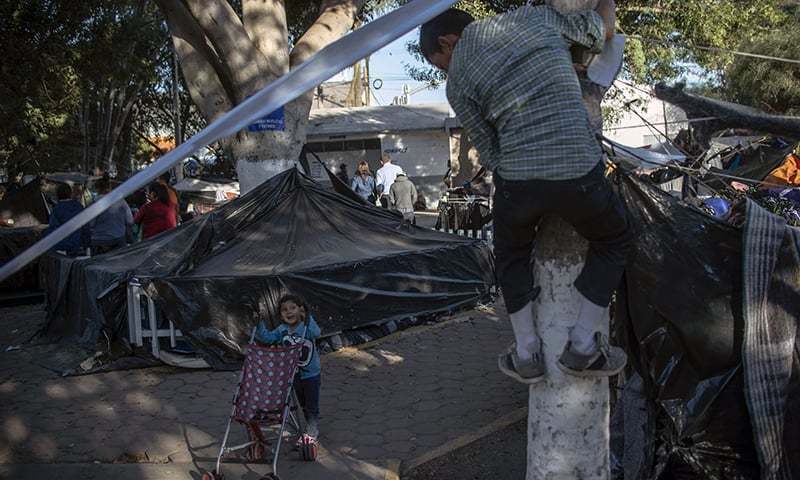 “I think it’s so unprecedented that everyone is hanging their own fears and political agendas on the caravan,” said Andrew Selee, president of the Migration Policy Institute, a nonpartisan think tank that studies immigration. Trump rails against migrant caravans as dangerous groups of mostly single men. That view featured heavily in his speeches during the midterm election campaign when several were hundreds of miles away, travelling on foot. Officials have said some 500 members are criminals but haven’t backed that up with details on why they think so. Mario Figueroa Tijuana’s social services department director who is overseeing operations at the sports complex where most of the migrants in the caravan are staying said as of Friday that of the 4,938 staying there, 933 were women, 889 were children and 3,105 were men, which includes fathers travelling with families along with single men. The US military said Monday that about 300 troops who had been deployed in south Texas and Arizona as part of a border security mission have been moved to California for similar work. “These children are barefoot. In diapers. Choking on tear gas,” California Gov.-elect Gavin Newsom tweeted. US Customs and Border Protection Commissioner Kevin McAleenan said the administration’s concerns about the caravan “were borne out and on fully display” Sunday. McAleenan said hundreds perhaps more than 1,000 people attempted to rush vehicle lanes at the San Ysidro crossing. Mexican authorities estimated the crowd at 500. The chaos followed what began as a peaceful march to appeal for the US to speed processing of asylum claims. After being stopped by Mexican authorities, the migrants split into groups. On the west side of the crossing, some tried to get through razor-wire fencing in a concrete levee that separates the two countries. On the east side, some pulled back a panel of fencing made of Army surplus steel landing mats to create an opening of about 4 feet, through which a group of more than 30 people crossed, according to a US official who was not authorised to discuss the matter publicly and spoke on condition of anonymity. Others made it over a steel fence farther east. McAleenan said four agents were struck with rocks but were not injured because they were wearing protective gear. Border Protection agents launched pepper spray balls in addition to tear gas in what officials said were on-the-spot decisions made by agents. US troops deployed to the border on Trump’s orders were not involved in the operation. “The agents on scene, in their professional judgement, made the decision to address those assaults using less lethal devices,” McAleenan told reporters. US authorities made 69 arrests Sunday. Mexican authorities said 39 people were arrested in Mexico. The scene left many migrants feeling they had lost whatever possibility they might have had for making asylum cases. Border Patrol agents have discretion on how to deploy less-than-lethal force. It must be both “objectively reasonable and necessary in order to carry out law enforcement duties” and used when other techniques are insufficient to control disorderly or violent subjects. Last week, Trump gave Defense Secretary Jim Mattis explicit authority to use military troops to protect Customs and Border Protection agents on the border, with lethal force if necessary. Mattis also was empowered to temporarily detain migrants in the event of violence against the border patrol. Mattis told reporters that this did not change the military’s mission in any way and that he would use the new authorities only in response to a request by Homeland Security Secretary Kirstjen Nielsen. He said there had been no such request yet. With the caravan as a backdrop, Trump has used national security powers to circumvent long-standing immigration law to deny asylum to anyone caught crossing the border illegally. However, a court has put those regulations on hold after civil liberties groups sued. On Thanksgiving Day, the president warned of “bedlam, chaos, injury and death” if the courts block his efforts to harden immigration rules.